The Religious of Christian Education, an order of nuns originally from France, established Hillside Convent School on January 6, 1908. 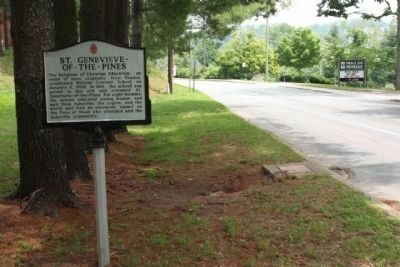 In 1910, the school was moved to this site and renamed St. Genevieve~of~the~Pines. For eight decades, the school educated young women and men from Asheville, the region, and the world and had an enormous impact on the lives of those who attended and the Asheville community. 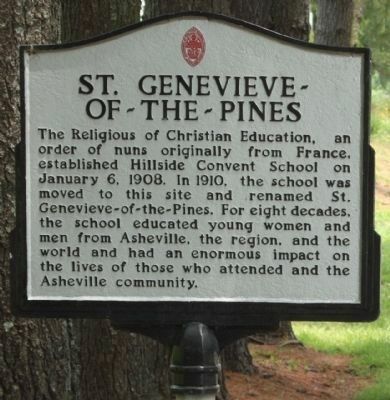 Erected by Saint Genevieve of the Pines Asheville North Carolina. Location. 35° 34.551′ N, 82° 33.136′ W. Marker is in Asheville, North Carolina, in Buncombe County. Marker is on Victoria Road south of McDowell Street (U.S. 25), on the right when traveling south. Touch for map. Marker is in this post office area: Asheville NC 28801, United States of America. Touch for directions. (approx. 0.7 miles away); The County of Buncombe (approx. 0.8 miles away); Private George Avery (approx. 0.9 miles away); Rutherford Trace (approx. one mile away). Touch for a list and map of all markers in Asheville. More. 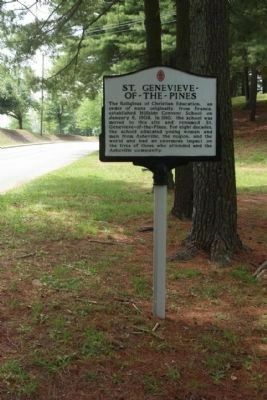 Search the internet for St. Genevieve ~ Of ~ The ~ Pines. Credits. This page was last revised on May 7, 2018. This page originally submitted on July 14, 2012, by Mike Stroud of Bluffton, South Carolina. This page has been viewed 1,121 times since then and 16 times this year. Photos: 1, 2, 3. submitted on July 14, 2012, by Mike Stroud of Bluffton, South Carolina.